There are many possible causes of hair loss, the most common of which is the medical condition androgenetic alopecia, or hereditary male and female pattern baldness. Not all instances of thinning hair, however, are attributable to genetic predisposition. At the New York hair loss clinic of True & Dorin, we understand that no two cases of hair loss are precisely the same. In order to provide the most effective treatment for hair loss, it is essential first to identify its underlying cause. There are a number of medical conditions that are associated with hair loss. At our hair loss clinic in New York, medical hair loss solutions are available to those whose hair is thinning due to a health issue. Telogen effluvium: This type of skin disorder is characterized by an excessive number of hair follicles entering into a rest cycle, and is not permanent. This condition often occurs after pregnancy, high fever, and surgery. Tinea capitis: This fungal infection of the scalp occurs most commonly in children and is generally curable if treated in its earliest stages. Traumatic alopecia: This skin disorder is caused by such actions as tight braiding or the use of chemical relaxers. Alopecia areata: This skin condition occurs in otherwise healthy people and is characterized by hair falling out in patches, often over the entire body. In some cases, the hair grows back; however, it can fall out again. 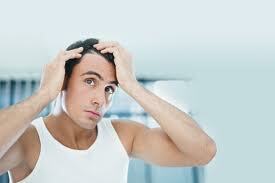 Hair loss can also be caused by deficiencies of protein, biotin, iron, and zinc. A number of hair loss disorders fall under the umbrella of scarring alopecia; most produce hair loss in patterns similar to alopecia areata. Most forms of scarring alopecia are permanent due to the fact that the hair follicles are destroyed and replaced by scar tissue. The condition can result in gradual hair loss or can be painful and rapid. There are a number of treatments for hair loss, each with its unique advantages and disadvantages. At our hair loss clinic in New York, follicular unit transplantation has been revolutionized by our doctors, who offer the superior True & Dorin strip procedure. This allows patients with skin and other medical conditions to restore density to balding areas in a way that looks entirely natural. If you have lost hair and are interested in learning about your hair restoration options, we encourage you to contact our New York hair loss clinic today. We can identify the source of your hair loss and devise a treatment plan that is perfectly suited to you.